and few berths available. It is best to dock at the marina of Porto Carras. turquoise waters, well protected from the wind. natural harbour in the whole Aegean Sea. It is sheltered in all weather conditions. Diaporos provides anchorage protected by any kind of weather. pontoons where you can find a berth. Go stern or bows to a pontoon / dock. issued by the office of Mount Athos at Ouranoupoli. Porto Koufo – Kyra Panagia: 40 nautical miles. You can stop at the coves of Planiti up north and Agios Petros to the southwest. Beautiful sandy clayey seabed that allows a good anchorage. uncomfortable surge. The strong winds reduce the safety of the anchorage. Sporades Islands and it is strongly recommended in case of bad weather. In the port of Loutrakio, northwest of the island, there’s only one floating pontoon. 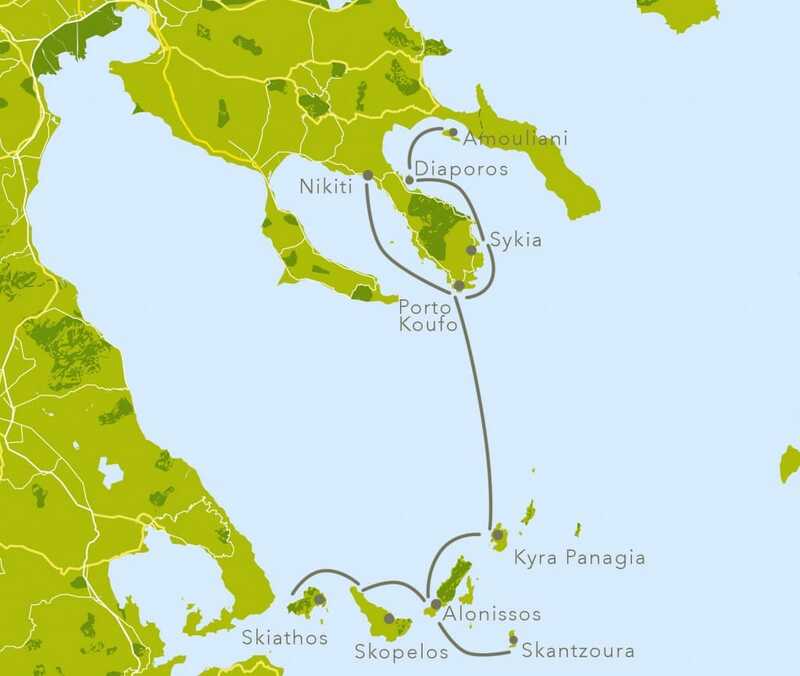 Skopelos (western part) – Skiathos : 12 nautical miles. and the small island of Tsougria. noisy with a lot of boats. To be avoided in the weekends starting Friday. where there is a good chance of getting your anchor crossed or stuck. where the anchors are intertwined.